You and Your Big Dreams: Hello Gorgeous! I hope you all survived the work week and having something wonderful planned for the weekend! I'm popping in to share the newest release from A Day For Daisies. There are some really beautiful images in the August Club Kit. When I first saw the Vintage Lipstick stamp my first thought was wow she's gorgeous followed quickly by and vintage . .grmarmgr. . .
and then did more research. See the problem is not that the stamp is perfect. It is. The problem is that all my normal "go to" ideas just aren't vintage. I really wanted to do this stamp justice. I always do. Don't you? Otherwise what the hell am I doing here? One of the things I noticed in my Google research, very serious business, was back in the late 1800s there was this ornate gold wallpaper everywhere. Usually in flourish or damask patterns. Oh wait . . .I have a Hero Arts stamp in my pile of crap I loved to death but never think to use anymore. This is the main reason I don't get rid of anything. What if I need it?! Normally this excuse is absurd I'm not going to use it but my hoarding ways paid off this time because the Large Fabric Design background stamp was perfect. Yes!! I printed out my gorgeous girl and colored her with copics. During that time period dark hair and minimal make-up was very popular. I like to think of my lady as a bit of a rebel putting on her lipstick so I made her hair a bit warmer and added some faint eye shadow. Who wants to fit in anyway? :) I colored her compact gold to match the background. Now the fun part! I was trying to figure out how to get that gold onto my project. Embossing? No, something a bit more subtle. Foil? Na, I'm too cheap . . .Perfect Pearls. Yes! I masked my girl and rubbed on distress inks in Victorian Velvet and Dusty Concord. I dried this completely. We don't want any strays sticking. I inked up my background with Versamark and pounced on some gold Perfect Pearls. It really was the perfect way to add it. The sentiment is from WPlus9's Hand-lettered Hello and I thought matched wonderfully. You can see the full release here. Lots of inspiration! Wow, you've only used Perfect Pearls, I'd have thought it's a real gold leaf finish! Looks like a genuine Klimt painting. Amazing! Gorgeous card, Kelly! Love that background - so very clever of you! You seriously ROCK!!! I love the vintage wall paper treatment you created on this card. Thank you for taking us through your process too. I love to see how others are inspired or what sparks their creativity. Reading about other people's creative processes fascinate me. STUNNING card Kelly!! She's totally gorgeous and so is her wallpaper! Way to work it! WOW - what a stunner - this is so dramatic Kelly, and yet the stamp takes the eye first. Love that background!! Tell me this ... who else is thinking Barbra in Funny Girl right now ... anyone? Helloooo gorgeous, indeed, Miss Kelly... I've got the film - you bring the popcorn! Stunning, stunning card! Superb coloring and that bg is brilliant. Well thought with perfect pearls! This is amazing and glorious and absolutely perfect in every way. You are one clever, clever crafter. Thank you for sharing! OMGoodness! This is so fabulous!! And you are so funny! 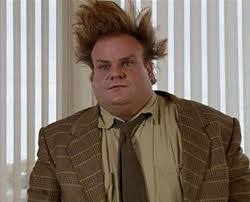 I'm dying here over the picture of Chris Farley!! Seriously I am always blown away by your awesome work!! Ok this article had me laughing and jaw dropping! Girl you rock!!! I think the way you did the background behind your beautiful lady is incredible and so totally phenomenal!! This card is just so chic and cool!! And lovely beyond anything at the same time!! You are a delight and I hop you had a beautiful weekend and I wish you a happy week full of smiles!! !